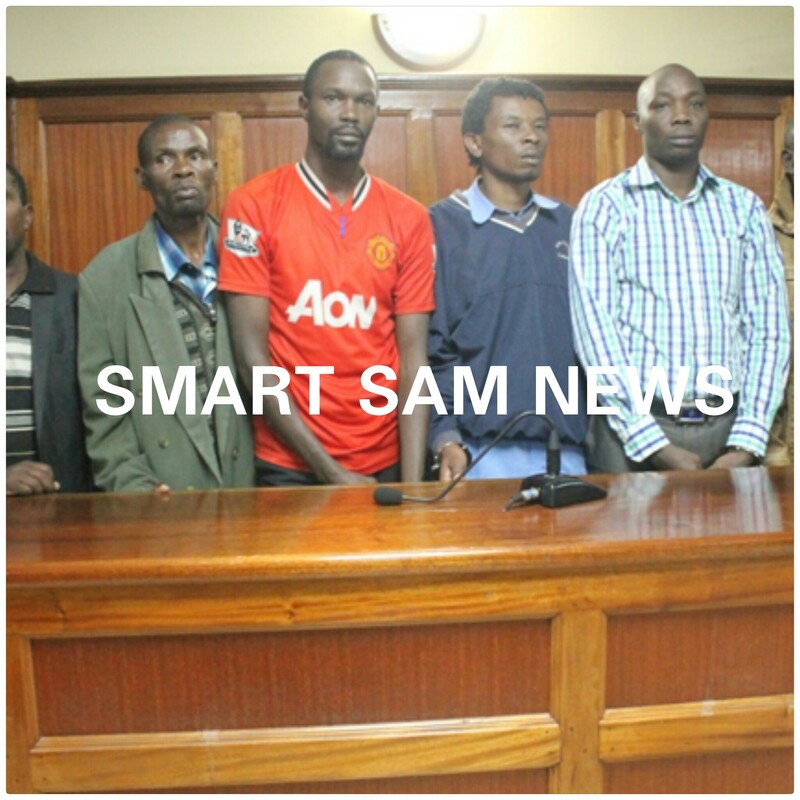 Some of the 16 current and former officials of Kihiu-Mwiri land buying company charged with murder of four director of the company in Kiambu and Murang’a counties at Milimani law courts on Wednesday 2 September, 2015. Sixteen former and current directors of the controversial Muranga based Kihiu Mwiri land buying company have been charged with murder. The officials however did not plead to the charges after the prosecution requested more time for the mental assessment report to be submitted in court. The suspects had been taken to Mathare Mental Hospital to ascertain their sanity before pleading to charges against them. High Court criminal division vacation Judge Jessie Lessit directed that that the plea to be deferred untilSeptember 21 awaiting mental assessment report and return of Judges from vacation. Seven of the suspects have been in police custody for the last 28 days while the rest were arrested in the process of investigations. State Counsel Catherine Mwaniki last week had made an application to detain seven of the 16 suspects for more 8 days to complete investigations. She had said that more time was need for investigators to recover weapons believed to have been used in the murders and make more arrests. Justice Nicholas Ombija gave the State until September 2 to either charge or release them. The sixteen are accused of murdering Peter Kimani Kuria on May 10 at Kihiu Mwiri in Murang’a County. They allegedly committed the offense jointly with others not before the court. They are also accused of Murdering Paul Muhuhi Bernard on June 28 at Majengo Estate in Thika within Kiambu County. The 16 are further accused of Murdering Josphat Kibe Nyoike on July 29 along Kihiu Mwiri in Murang’a County jointly with others who were not before the court. The 16 suspects further faced a fourth count of murdering Zakary Chege Kiratu on July 29 along Kihiu Mwiri in Murang’a County. Lawyers Evans Ondieki and Mbiyu Kariuki opposed the charges, accusing the police and prosecution of violating the Constitutional rights of the accused by holding them without charge for an extended period of time. Justice Lessit however directed the counsels to submit their com plains in writing. The 15 men will be detained at Industrial area Prisons while the one Lady at Lang’ata women prisons.